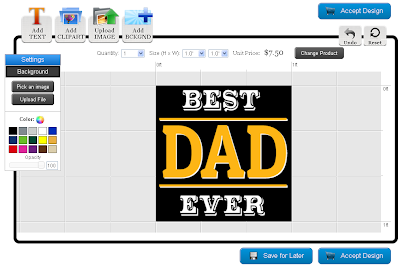 You Can Now Design Decals in Our Online Designer! Decals are a form of sticker that you can apply to cars, trucks, boats, windows and other materials to advertise your company or as a form of decoration. Our standard finishing for decals is square cut. If you need a dye cut decal, you will need to work with a graphic designer to make sure the cut paths work correctly. Depending on your needs, we have three different types of materials available: 3M Controltac, Calendered Vinyl with Lamination and High Performance Cast Vinyl with Lamination.You will need to select a material to begin. Once you are on the product page, there are two easy steps. The decals are sized in half foot increments. You will need to select the height and width from the drop down menu. You will also need to select the quantity of decals. Please note this is the quantity per artwork file. If you need multiple artwork files, you will need to design each one separately. There are three different ways to order your decals. You can pick a template, upload a file that you have already created, or you can have one of our designers design the decal for you (pick this method if you need a shape cut decal). We will be discussing the picking a template and designing your decal in the online designer. If there is a template that you would like to customize, all you have to do is put your mouse over the template and click on the "Customize Template" button. This will take you into the online designer. All of the templates are fully customizable. You can also start from scratch by selecting the "Blank Template" option. Once you are in the online designer, you can add text, clip art, backgrounds and upload images. In order to select those options, click on the buttons at the top of the designer. Click here for step by step direction on how to use the online designer. 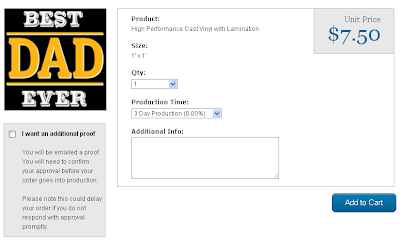 Once you have finished your decal design and would like to begin the checkout process, click on the "Accept Design" button. 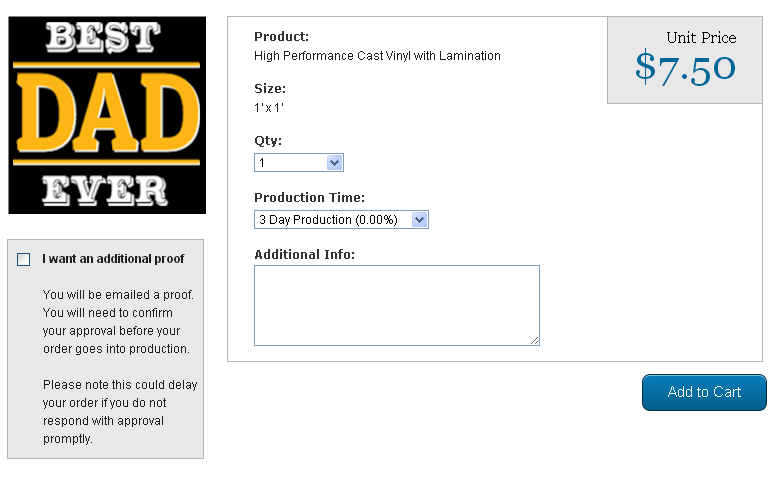 If you would like to design another decal, or select another product, click on the "Save for Later" button. Once you have clicked on the "Accept Design" button you will be taken to the product options page. You will have the option to receive an additional proof. If you select that option you will receive an email from a custom service representative with all of your order information. You must email the rep back with your approval before your order will go into production.You can also put any additional information about your order in the box. Once everything is ready to go, click on the "Add to Cart" button. After you click on the "Add to Cart" button you will be taken to your shopping cart. This will show you all of the products you have designed and your pricing information. You will still be able to edit the quantity from the cart. 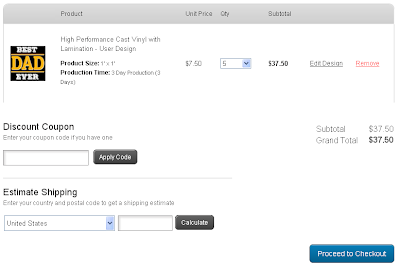 You can also go back and edit any of your designs or remove products from the cart. You can apply any discount codes and get your shipping information. When you are ready to proceed, click on the "Proceed to Checkout" button. If you aren't already logged in, you will have the log in or create an account.You will then be taken to the billing and shipping page. Once you have entered in your information, click on the "Review My Order" button to proceed with your order. If you would like to get started on your decal order, please visit our decals page, or one of the decal product pages: 3M Controltac, Calendered Vinyl with Lamination or High Performance Cast Vinyl with Lamination.